Homemade cat food used to scare me. I was afraid of nutrient imbalances, didn’t know what equipment I needed, and wasn’t ready to spend hours of every month preparing cat food. Are there nutritionally balanced recipes out there or is everyone following the one that “looks like” it makes sense? Is it okay to give your cat bacteria-infested raw food? Can people of modest financial resources afford to make homemade cat food? To find the answers to these questions and more, I’ve consulted research papers from sources like the British Journal of Nutrition, the Journal of Feline Medicine and Surgery, and BMC Veterinary Research. I’ve explored forum threads and personal accounts from cat food makers. I’ve spent hours talking to experts in feline nutrition. This resource is the result of that research. It’s made for someone who’s considering making their own cat food but doesn’t want to kill their cat by feeding them an imbalanced diet. Maybe that’s you. If so, keep reading to get some answers and maybe a little bit of cat food-making confidence. Know if homemade cat food is right for you. Have a better understanding of the differences between homemade and commercially-available cat food. Be familiar with the different types of homemade cat food. Be able to compile a shopping list for your first batch of homemade cat food. Have multiple tried-and-true recipes to bookmark or print for future reference. Why make homemade cat food? When you make your own cat food, you control what goes into your cat’s body. You become the cat food manufacturer, so you can do things your way. Because making your own cat food lets you choose the proteins in your cat’s bowl, homemade cat food is perfect for allergic cats. In 2013, DNA testing found that most limited-ingredient or hypoallergenic diets contained proteins that weren’t mentioned on the label. Ironically, the study found that of all the unlabeled ingredients detected in pet foods, chicken was the most common. That’s right—one of the leading cat allergens. Cats suffering from IBD, IBS, or a sensitive stomach. Whether your cat has chronic inflammation or is experiencing acute GI distress, making food at home lets you tailor their diet to work harmoniously with their body. Remember that while homemade cat food can be a good choice for cats with health problems, no recipe is the right fit for every cat. Cats with CKD, for instance, require a unique balance of phosphorus, magnesium, and other dietary components. Not every recipe will satisfy these needs. Anyone who’s frustrated by the pet food industry. If you’re outdone by constant recalls and can’t find food that meets your standards, then homemade food might be your solution. Homemade cat food isn’t perfect, and neither is commercial food. Homemade cat food can be the greatest gift you’ll ever give your cat or it could be the most harmful thing you can do to them. Most people wouldn’t want to deal with that responsibility. Instead, most of us leave it up to experts to formulate and manufacture our cats’ food. But the idea that commercial cat food is safer than homemade food is a misnomer. Makers of mass-produced commercial cat food slip up every day. Recalls can hit anyone and they happen all the time, but don’t think that they’re the complete story. If one cat gets sick after eating a bad can of food, who will know? One day, a production worker drops her gum in the cat food. The next day, someone else doesn’t get the thiamine levels quite right. Human error occurs in food preparation operations on every level. Even the sloppiest home foodmaker wouldn’t fill their cat’s food with melamine-tainted “wheat gluten”. It’s impossible to know how many cats and dogs died after eating pet food laced with toxic melamine in 2007. Those who remember this mass recall know the feeling of betrayal experienced by pet guardians across North America, Australia, and China. This food was supposed to be safe, fun, and healthy—no one suspected that it would cause acute renal failure. Cat food manufacturers produced taurine-deficient diets into the late 1980s. 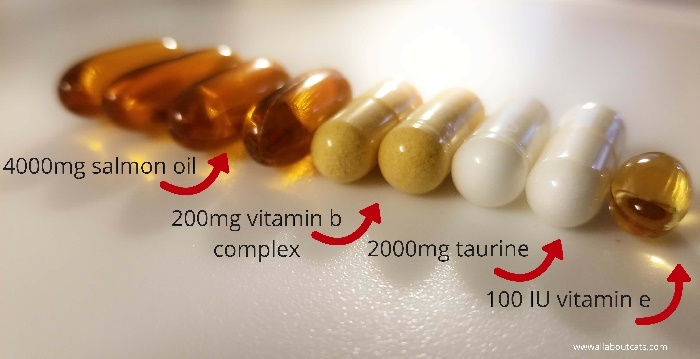 When people warn that deficiencies are common among homemade foods, do they forget that taurine deficiencies weren’t recognized until the late 1970s, long after the pet food industry was well-established and churning out nutritionally inadequate kibble and canned food? 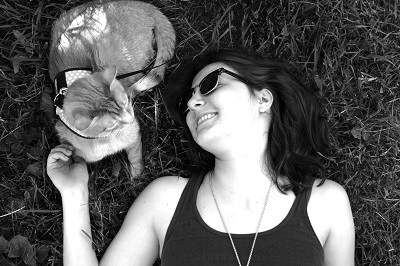 After recognizing taurine’s significance in 1976, the NRC’s guidelines were still loose and vague on taurine, allowing more cats to die from heart disease associated with taurine deficiency. A 1987 article in the Los Angeles Times says that thousands of cat deaths were caused by taurine deficiency. The affected cats ate food from leading brands like Hill’s Science Diet, Purina Cat Chow, 9 Lives, and Fancy Feast. All dry food is deficient in water, but who seems to care? 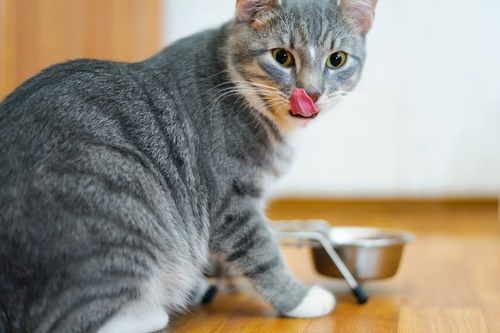 Your vet may discourage you from making homemade cat food due to its potential to encourage nutritional deficiencies, but how do they feel about the fact that dry cat food is outrageously deficient in water—the most important nutrient of all? Dry food is linked to chronic dehydration and an increased risk of feline lower urinary tract disease. Commercial cat food contributes to the feline obesity epidemic. According to Banfield’s State of Pet Health report, the number of overweight cats has increased by 169% in the last 10 years. An estimated one in three cats is obese. That’s not cute. It’s an epidemic. Data sources: Association for Pet Obesity Prevention Surveys 2007-2017, Lund EM (2005): Prevalence and risk factors for obesity in adult cats from private us veterinary practices. International Journal of Applied Research in Veterinary Medicine 3, 88–96. More cats live indoors than ever before, and they are for the first time in history virtually reliant on humans for food. They barely exercise and they’re loading up on carbohydrate-laden food and treats. When an obligate carnivore with zero physical requirement for sugars or starches eats dry food, their bodies will naturally convert the excess carbohydrate to fat. Species-appropriate feeding could correct the growing feline diabetes problem. Dr. Elizabeth Hodgkins, cat nutrition expert and author of Your Cat: Simple New Secrets to a Longer, Stronger Life describes feline diabetes as “a human-caused disease that kills cats.” Dry cat food—and some carb-laden canned foods—flood your cat’s system with 500% – 1000% more calories from carbohydrate than they’d eat naturally. A carbohydrate-dense diet may increase your cat’s risk of diabetes and it increases their risk of continuing to suffer from the condition. The ubiquitous “complete and balanced” label means less than you might think it does. In the United States, cat food is formulated according to the nutrient profiles established by the Association of American Feed Control Officials (AAFCO). These nutrient profiles provide an invaluable guideline for cat food nutritional requirements, but do not guarantee that the labeled food is nutritionally flawless. Foods are tested against nutrient profiles or subjected to a 26-week feeding trial. This trial involves eight cats, two of which are permitted to drop out. If, at the end of the trial, the cats haven’t lost more than 15% of their body weight and their bloodwork comes back normal, the food is deemed fit for the marketplace. Clearly, nutritional adequacy over the course of six months is hardly indicative of lifetime nourishment potential. Cats on criminally deficient diets can produce healthy blood work until the deficiency has reached a critical stage. Considering that most pet food regulatory agencies and oversight groups do not account for nutrient bioavailability, nutrient values after cooking, and barely require legitimate feeding trials, there’s no authority ensuring that commercial cat food is appropriate for daily feeding for the life of your cat. Again, homemade cat food isn’t perfect. But neither is anything on the cat food aisle. I’ve attempted to undermine your faith in commercial cat food, not because commercial food is all bad—it can be very, very good—but to help you to see that no food is flawless or completely safe. Homemade cat food can be as time-consuming or as simple as you want it to be. You don’t need to have endless free time or be a nutrition expert to prepare food for your cat. You can make cooked food, raw food, or semi-cooked food. This is the most popular type of homemade cat food. It requires minimal supplementation compared to cooked foods. That doesn’t mean that raw food alone is an adequate diet. You’ll still need to add supplements to ensure that the food is nutritionally complete. While some express concerns about the potential bacteria content of raw meat, it’s important to remember that your cat’s stomach acid is about 10 times more concentrated than a human’s. Cats have been eating dead animals for thousands of years. Bacteria is more a concern for you than it is for them. Semi-cooked food undergoes a brief baking process, which kills surface bacteria and renders the food safer than a purely raw product. It does, however, introduce some nutritional variables. It’s difficult to know exactly how much nutrient value is destroyed during par-cooking. Homemade cooked food is great for people worried about pathogenic bacteria, parasites, and other organisms that could make them or their cats ill. However, it’s more difficult to get a complete and balanced homemade cooked diet than a raw one. How do you know your homemade cat food is nutritionally complete and healthy? Not all homemade cat food recipes are nutritionally complete, nor are they all balanced. When researchers from the University of California, Davis School of Veterinary Medicine analyzed 200 different homemade dog food recipes in cookbooks and online guides, the team found that 95% lacked at least one key nutrient. Only four of the recipes analyzed were nutritionally complete and balanced. To help you to separate bad recipes from good ones, here are a few nutritional rules. Our cats are genetically almost identical to African wildcats. Unlike dogs, their dietary needs have not evolved from their ancient roots. Indeed, cats have only been eating commercial human-made food for the last century. Prior to that, they ate what they always have—lizards, rodents, birds, and bugs. After putting together 27 studies on the diet of free-roaming cats, the authors of an article published in the British Journal of Nutrition reached some conclusions about nature’s dietary requirements. They found that the macronutrient content of a feral cat’s diet, with essentially no access to human food or garbage, was 52% crude protein, 46% crude fat, and only 2% calories from N-free extract, a term that refers to everything that’s not fat, fiber, or protein. 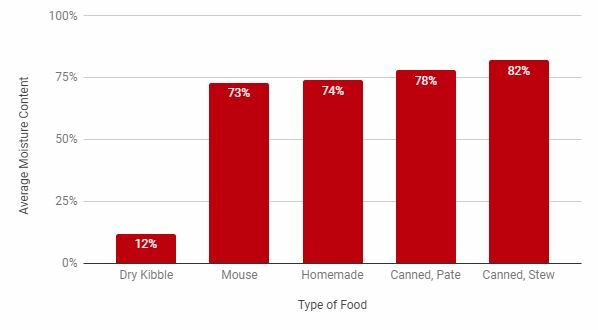 To help you understand how homemade cat food compares to commercial foods, here’s a comparison chart showing the differences between macronutrient values found in several foods. If you are cooking your cat’s food, it is okay to feed them pre-ground meat with supplements mixed in. If you’re feeding it raw, grind it yourself the day you prepare the food. When most butchers grind meat, they know that the meat will be cooked before anyone eats it. This means that ground meat is held to a low sanitation standard compared to meat ground to eat raw. Ideally, you’ll use a powerful meat grinder to grind your meat with the bones intact. If you don’t have a grinder strong enough to handle bones, you should either upgrade or use a grinder-free method. 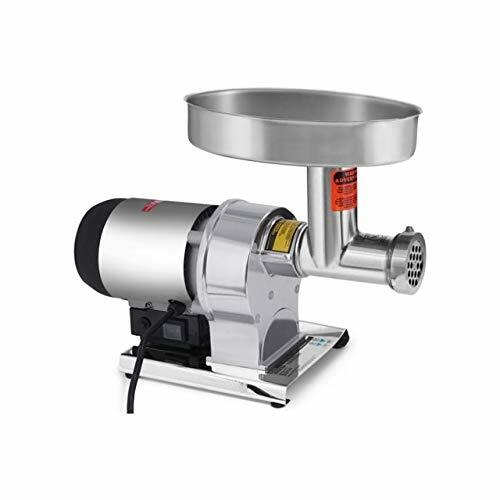 This powerful grinder has enough muscle to handle bones and large quantities of meat. It costs over $500, so if you’re on a tight budget, you might choose the Sunmile SM-G50. If you have a Vitamix or equally powerful blender or food processor, you may use it instead of a meat grinder. Other less powerful blenders won’t be able to handle the bones, so don’t risk it. If you don’t have a Vitamix or a grinder, you can make your cat food without bones. Instead of taking the ultra-natural approach and grinding the meat and bones together, you can use boneless meat and a bone substitute like bone meal powder or eggshell powder. One route is to use a food processor or blender to grind the boneless meat and organs. While it will take more time, you can also mince the meat with a knife. Here’s a guide to grinding meat by hand. Whatever method you choose, I recommend leaving a few chunks of meat for your cat to chew and gnaw. This is good for their teeth and, I believe, emotionally nourishing for your cat. When dealing with large quantities of raw meat, a large cutting board really makes life more comfortable. Regardless of size, your cutting board should be dishwasher-safe so that you can easily give it a thorough cleaning. 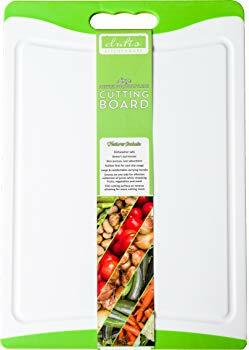 After using a small cutting board and constantly worrying about meat sliding onto the counter, I finally invested in this large board. It’s transformed my attitude towards preparing homemade cat food. These allow you to measure out precise amounts of meat and organs, ensuring that the recipe is balanced. You’ll be weighing large amounts of meat, so be sure to get one that can handle at least 10 lbs. If you don’t have a kitchen scale and aren’t prepared to buy one now, you can ask your butcher to measure specific amounts of meat and organs. 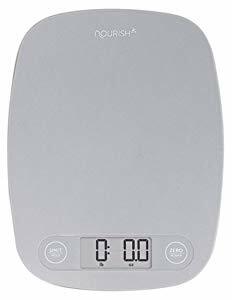 This economical kitchen scale has an 11 lb capacity, so you can weigh a lot of ingredients with it. Some prefer a scale with a built-in bowl, but I prefer the flat top so that I can pair it with my bowls or storage containers. Once you’ve gone through your checklist of preparation supplies, it’s time to get your hands on some ingredients. 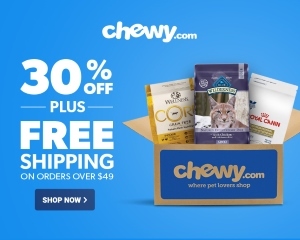 A cat’s prey is approximately 83% meat, fat, skin, sinew, connective tissue, and heart, with 7% edible bone, 5% liver, and 5% other secreting organs. You’ll need to include muscle meat, bones, organs, and supplements. Which Type of Meat is Best? To prevent your cat from developing food allergies, feed a rotational diet and don’t become reliant on any one animal protein source. Chicken is an economical, easy-to-find meat. 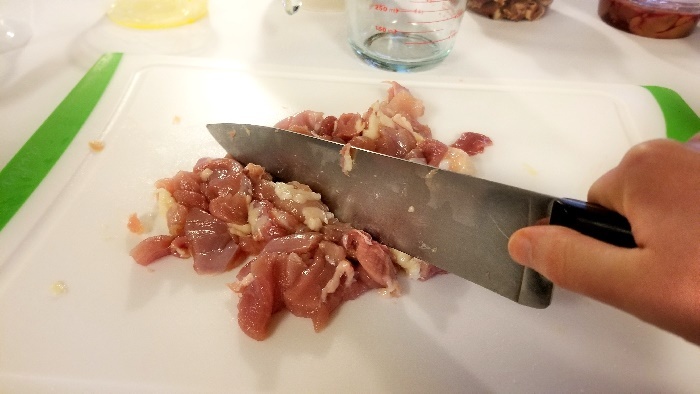 Chicken organs are easy to find in most grocery stores, so there’s no need to seek out a butcher shop or go out of your way to find liver and other organs. Another nice thing about chicken and poultry, in general, is that it has a high meat-to-bone ratio. Bones are an essential part of a homemade diet, but it’s possible to give your cat too much, resulting in constipation or over-mineralization. The latter can lead to urinary crystals. You can use either whole carcasses or parts of the birds. If you choose to buy cuts of poultry, feed about 75% dark meat and 25% white meat. Dark meat has more appropriate fat levels, is more nutrient-dense, and contains more taurine, but white meat has methionine, which can help to prevent FLUTD. Turkey thighs, breast meat, and organs are usually very appetizing to cats and can be a good alternative to chicken for poultry-loving felines. If you can’t find turkey hearts or livers, you can substitute chicken parts. What’s great about rabbit is that it’s a natural part of the feline diet. Some domesticated cats kill and eat wild rabbits half their size. Rabbit is lean and is skinned prior to processing, so you’ll want to add in additional animal fat from poultry or other animals. Remember, also, that rabbit has a higher bone-to-meat ratio than poultry, so you may want to remove some of the bones before preparing rabbit-based homemade cat food. You can feed your cat almost any type of meat that’s convenient for you. Whenever feeding wild game, it’s important to freeze the meat to kill parasites before preparing your cat’s food. Don’t feed your cat wild boar, pig, bear, or—if you can get it—walrus meat. These may transmit pseudorabies. Don’t feed your cat squirrel, either, due to the potential for leptospirosis transmission. Though it’s scrumptious and makes a great snack, ocean fish is contaminated with heavy metals and toxins, making it an inappropriate choice for daily feeding. Cats who consume a raw diet comprised primarily of fish are at risk of thiamine deficiency. Liver is jam-packed with nutrients. It’s an excellent source of vitamin A and D, along with copper and zinc. Chicken liver is the most commonly available type, but you can get it from almost any other animal. It’s important to note that beef liver has more copper than liver from other animals. If feeding your cat a beef-based diet, be sure to source liver from another species. Hearts are muscles, not organs. They are a key source of taurine. Hearts are muscle meat, but in contrast to other types of muscle meat, heart is rich in taurine. Cats cannot synthesize this amino acid, but it’s essential for good health. Chicken hearts are the easiest types of heart to source, but they’re not as taurine-dense as a mouse heart. For this reason, you can’t rely on hearts alone as a source of taurine. It’s important to add a taurine supplement. Note that if you’re feeding your cat homemade cat food on an occasional basis as a supplement to a nutritionally complete product, you don’t need to worry about following a complete and balanced recipe. If, however, your cat will be eating raw food every day for a week or more, you must follow a good recipe. You can choose from recipes accompanied by a nutritional analysis, which is ideal, or follow one that’s tried-and-true. Some recipes are neither, and these are the ones you need to avoid. The following recipes were chosen based on a combination of reputation and apparent quality. This raw cat food recipe was adapted from one published by the Feline Nutrition Foundation, a non-profit organization lead by veterinarians and other people who are passionate about feline nutrition. The recipe makes enough to feed one cat for about two weeks. 1. Set up your workspace. Making cat food is so much easier when you’re prepared! I’ve found that covering the workstation with newspaper or another disposable covering is a great way to minimize cleanup time after you’re done making the food. If you’re particularly worried about bacteria and infection, wear gloves. Remember to change the gloves throughout your process to avoid cross-contamination. 2. Weigh, count, and measure your ingredients. 3. Use a sharp knife to chop about a quarter of the muscle meat into chunks. Chunks give your cat something to chew on, which helps to minimize tartar buildup and encourages good oral health. Start with small chunks or strips and work your way up to larger pieces for your cat to gnaw on. 4. Grind the rest of the muscle meat with the organs. Again, you have a few options here. Unless you have a very high-powered blender, you’ll need to use a grinder to break down the bones. You want the bone pieces to be fairly small. Any bones remaining in the grinder should be discarded. Those preparing a boneless interpretation of the recipe can use a food processor or blender to break the meat down to a soft, mixable grind. 5. Whisk the vitamins, egg yolks, and water together in a medium-sized bowl. If you’re using boneless meat, this is where you’d mix in the eggshell powder. If you’re grinding in the bones, just use taurine, fish oil, vitamin E, B-complex, and lite salt. 6. Mix everything together in the biggest mixing bowl you own. This stage can get messy, so choose a huge bowl to minimize spillage. Use a large spoon to gently and thoroughly incorporate the vitamin slurry into the muscle meat and organs. It’s very important to mix well—you don’t want your cat to have one nutritionally deficient meal and another that’s excessively supplemented. The idea is for everything to be fully incorporated for a balanced diet. 7. Transfer the food into your storage containers. Pull out your storage containers, place them close to the bowl to avoid messiness, and start transferring the finished homemade food into your storage containers. A food scale is helpful here. Without a scale, you’d either have to get your measuring cup dirty or rely on guesswork to give your cat daily portions of raw food. A food scale allows you to measure the homemade food in the container—no need to wash more dishes or wonder if you’re giving your cat the right amount of food. 8. Freeze what you can’t use within the next 48 hours and then clean up after yourself. I usually use sanitizing wipes to clean up small messes while I’m working and then use soap and water to thoroughly clean the counter, sink, and any other soiled areas once I’m done. If I’m feeling particularly worried about sanitation, I’ll use a solution of water and bleach on top of everything else. I realize that many readers won’t want to use these toxic cleaning products around their cats. If you’re worried about your cat ingesting these cleansers, a vinegar and water solution will also work. How much homemade cat food should you feed? Most adult cats need around 200 calories per day. This usually translates to 6 oz of homemade cat food, but of course, the amounts will vary based on your recipe. The above raw cat food recipe from the Feline Nutrition Foundation contains about 35 calories per ounce. Ask your veterinarian or a respected veterinary nutritionist to evaluate your homemade diet for kitten-appropriateness. Remember that your kitten’s food requirements are calculated on their predicted adult weight, not their current weight. They’ll need to eat about 5% of their predicted adult weight each day. If you think your kitten will grow up to weigh a healthy 10 lbs, they’ll need to eat about 8 oz daily. A large-breed kitten like a young Savannah might need 13 oz or more. How much does homemade cat food cost? The answer to this question is extremely variable. It depends on the price of meat where you live, which types of meat you use, and what recipe you rely on. Here’s a price comparison chart to help you understand how homemade cat food compares to other types of food. 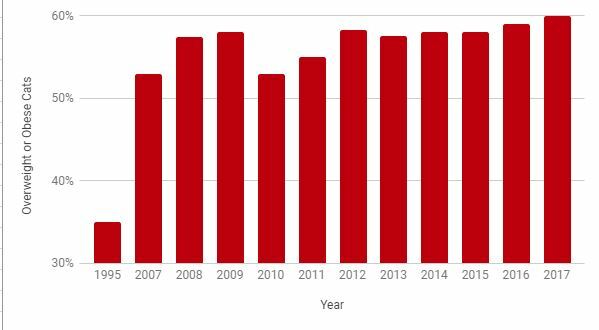 All averages were calculated for a 10-lb cat and based on prices in October and November 2018. 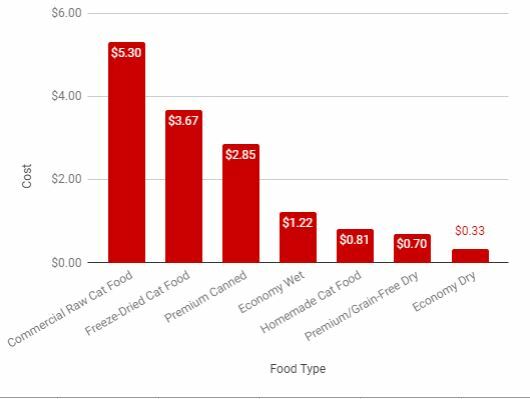 Surprisingly, homemade cat food is one of the cheapest options in this chart. Granted, this is on the low end of the homemade food price spectrum. By including organic novel proteins, you could easily rachet the price up closer to the premium end. There is more than one way to feed your cat a great diet. It doesn’t have to be all raw, all cooked, or even all homemade. And it can change over time. Don’t feel any pressure to go “all in” right now. There’s no moral dichotomy between raw, cooked, and commercial food. It’s fine to feed your cat a mix of all of those. In fact, feeding your cat a varied diet is a great way to ensure that they remain healthy and adaptable throughout life. For those afraid they won’t get things right, there are some great options that are less prone to imbalances and human error. You might use a premix from companies like TCFeline, EZComplete, and Alnutrin. These supplement blends take some of the fear out of making your cat’s food. Because everything is premeasured for optimal nutrition, the results are always virtually the same, diminishing the potential for deficiencies over time. Or you might skip the “box cake mix” approach and just opt for a stellar commercial food. Consider NomNomNow. This company makes and sells human grade, homemade-style foods. Just like food you might make at home, each pouch of their food is made-to-order in small batches from restaurant-quality ingredients. This is very informative. I use TCFeline’s raw premix and just add ground chicken (my cats seem to dislike beef, turkey and even rabbit), raw liver, egg yokes, and water. I also give them Stella and Chewy’s freeze dried food for treats. I must admit I still give them a small amount of dry food because I have a cat that will only eat a small amount of the raw. I have to follow him around with his plate of food but he still only eats less than half of hat the other cats eat.